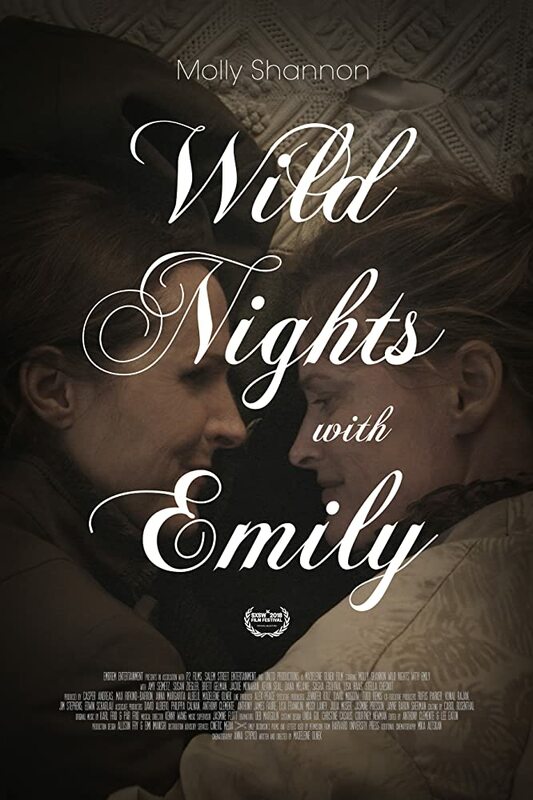 Movie: "Wild Nights with Emily"
A look into the life of Emily Dickinson and her possible romantic relationship with her sister-in-law Susan Gilbert Dickinson. a side of Emily oft not seen. or so it was in her time. her "Wild Nights With Emily." Ok, we're not poets, but Emily Dickinson (Molly Shannon) was, and though she was never fully appreciated in her lifetime, her work became world-renowned posthumously, which is like "the heaven of the literary world." Many believe Dickinson was a reclusive spinster, but another theory has been presented based on her restored original writings that she wasn't a recluse at all, that she actually never married because she was a lesbian. Writer/director Madeleine Olnek explores this very idea in her comedic period piece "Wild Nights with Emily." Olnek integrates Emily's poetry into the script and uses it to create the argument that Emily was gay, and that her sister-in-law Susan (Susan Ziegler) was her lover. At the same time, this idea is contrasted with the initial public story told by Emily's first publisher Mabel Todd (Amy Seimetz). Mabel is painted as an unreliable narrator due to the fact she was the mistress of Austin Dickinson (Kevin Seal), Emily's brother and Susan's husband. The concept of "Wild Nights with Emily" is really what drew us to it in the first place. It offers a portrayal of Emily Dickinson we haven't seen before. That being said, the movie as a whole left us feeling a little flat. The acting is purposefully stiff to capture the stuffiness of the era, at least that's what we assumed and hope that's the case. Either way, it didn't really work for us all the time. We found that the best, most charmingly funny moments were thanks in large part to Molly Shannon. Shannon is able to do a lot with just the nuance of her expressions despite the laughs being too few and far between. We would be hardpressed to remember a bad Molly Shannon performance as we have always liked and appreciated her as an actor. The narrative doesn't always flow seamlessly, and again, this may be a distinct choice by the filmmaker to mirror the ebbs and flows of Emily Dickinson's unique, uncommon prose. Unfortunately (and sadly), this disjointedness didn't keep us fully engaged. One specific thing that bothered us narratively speaking is how every romantic interaction between Susan and Emily is played for laughs. A little sincerity in the romantic aspects could have gone a long way. The overall look of the film felt more like an episodic television show as opposed to a feature film that takes place in the late 1800's, but at least the costumes looked accurate and gorgeous. "Wild Nights with Emily" deals with an interesting subject, we just wish it had been handled in a slightly more clever manner. Despite its good performances, we were left feeling a bit "blah" about the movie as a whole, which is sad since we were very much looking forward to it.